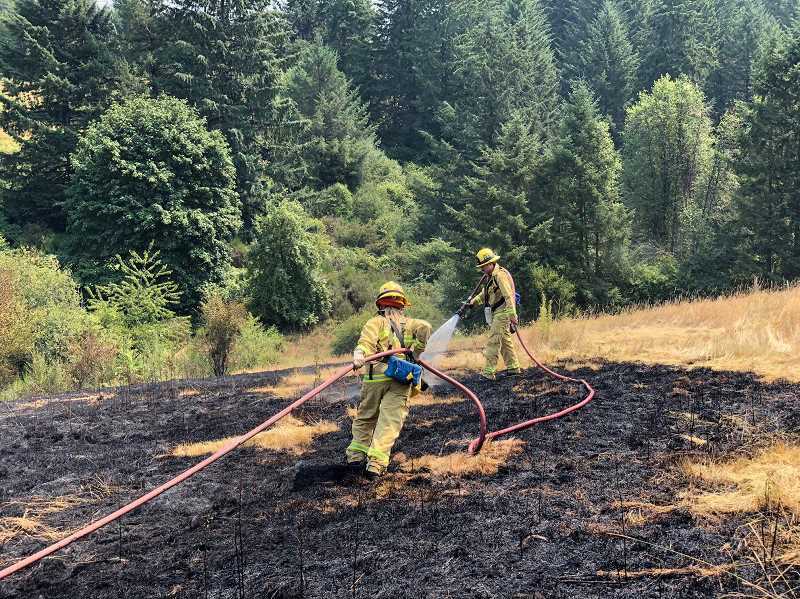 As temperatures once again soared near triple digits Thursday, Tualatin Valley Fire & Rescue responded to two fires in the West Linn area. The first incident was a small brush fire in the woods near West Linn High School, according to TVFR spokesperson Stefan Myers. 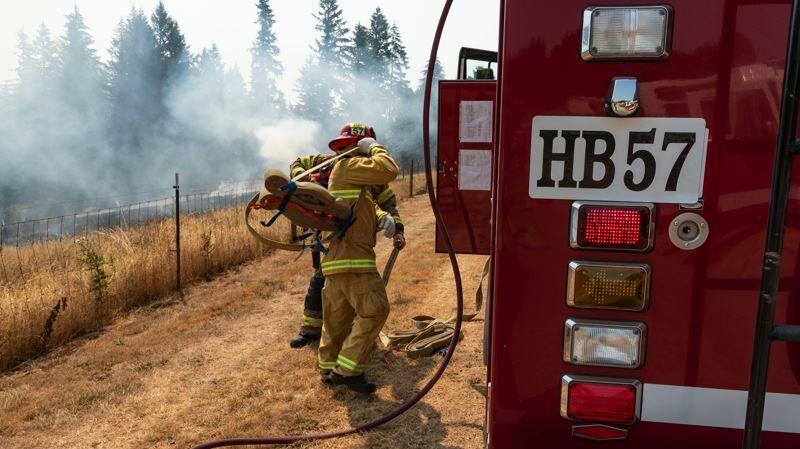 The fire, which was reported around 8:20 a.m., covered a small area of about 100 feet by 100 feet, but proved difficult to access because of brush and poison oak. "(Crews) pulled back and were able to get an aerial stream from a brand new truck," Myers said. "The aerial stream helped get it extinguished." A more substantial blaze was reported just after noon near SW Schaeffer and SW W Roads. "We had some 9-1-1 callers report smoke coming from a field," Myers said. "We got out there and found an active fire covering more than three acres, spreading to some trees and on the other side of the trees was a home. We got it out quickly before it got to the trees, but there were some special challenges." The primary challenge came in the form of yellow jackets, which were also related to what caused the fire. According to Myers, the property owner was attempting to destroy the yellow jackets' nest and lost control of the fire. "As it was explained to the investigator, the homeowner was using fuel to eradicate the nest, and after igniting it the fire got out of the control of his suppression tools," Myers said. "There were no injuries, and it didn't hurt any of the structures." Myers said the incidents Thursday were a reminder of the dangers associated with such hot temperatures. "When the humidity drops and temperatures rise, small sparks can become a big problem," Myers said. "It's a good time for everybody to be exercising extreme caution." Myers said residents should be especially careful with household and landscaping tools. "The community doesn't have as much exposure to how destructive fire can be and how quickly a small, controllable situation can get out of your control," he said.